The Fifield District was once Australia’s largest dedicated platinum producer. Platinum group metals and alloys, together with gold, were first discovered at Fifield in the 1880’s and are reported to have been produced from three alluvial leads (paleochannels), namely the Gillenbine, Fifield and Platina leads. The Platina lead is the largest of these at 3km strike length and 10m~25m deep. The deposits were shallow and worked by surface mining with the ore material being first collected by horse drawn scoops. Deeper deposits were worked by underground selective hand mining. The usual method of treatment was to puddle the wash in puddling machines operated by horse or steam power, then to pass the de-slimed material through sluice boxes. The sluice box concentrates were further concentrated by hand panning and the gold was separated from the platinum by amalgamation with mercury. The Fifield alluvial platinum deposits have recorded production of 650 kg (20,000 Oz) of platinum since the 1880’s and 6,200Oz of gold. Historical mining techniques, a lack of water, and limited processing technology meant that a high grade was required for viability of historical operations. The reported historic head grade in the Platina Lead was around 15 g/t platinum grade. Despite the early mining history drawing a significant population of prospectors and miners from the 1880’s, the Fifield district has seen very limited modern exploration. The underlying geological prospectivity of Rimfire’s tenement package is in part due to the presence and coalescence of major deep crustal scale structural trends; the Lachlan Transverse Zone and the Platina-Tresylva trend, which parallels the mineralised Gilmore Suture, within an interpreted Siluro-Devonian Rift Basin. The rift basin setting occurs in the back-arc to the world class Macquarie Arc which hosts Newcrest Mining’s giant Cadia Valley Operations, and the North Parkes porphyry systems, along with many other deposits, including Regis Resources’ McPhillamys deposit. The Fifield rift basin overlies a terrain boundary between lower and upper Ordovician rocks and provides the backdrop for what appears to be carbonate base metal epithermal Au/Ag style mineralisation encountered to date at Sorpresa. Rimfire has also revealed geological evidence for an additional target style at Fifield, possibly akin to the highgrade Tritton copper mine to the north. Similar stratigraphic and alteration assemblages have been observed at Fifield, particularly at the new Carlisle and Eclipse trend regional targets. The Tritton deposit is considered a Besshi style Volcanogenic Massive Sulphide (VMS) Cu-Au deposit, which remains a very attractive target style for Rimfire. Modern day systematic exploration techniques applied by Rimfire quickly resulted in the greenfields discovery of the Sorpresa Au/Ag deposit. Given the lack of cover across the region, generally less than 10m, quick, simple and inexpensive exploration techniques such as rock chip, soil and auger geochemical sampling and shallow RAB and RC drilling are effective in generating targets. Broader application of these techniques on systematic grids, coupled with geophysical surveys such as aeromagnetics, gravity, and induced polarization has generated a significant pipeline of more than 30 exploration targets at various stages of assessment. Despite the area being exposed to significant gold and platinum mining since the 1880’s, it wasn’t until the 1940’s that gold and base metal mineralisation at Sorpresa was first discovered. A local prospector named George Green recognised a gossan outcrop in what is now the northern part of Sorpresa and dug a shaft to approximately 16m. Rock chip sampling of mullock in 1969 by Platina Developments returned silver results “in excess of 4 Oz /ton Ag” and gold results up to 6g/t Au. Platina drilled two percussion holes at the George Green Prospect, however results cannot be located. Follow-up rock chip sampling at the proximal location by Rimfire in March 2009 returned gold up to 8.84g/t Au and renamed the prospect “Original Sorpresa”. George and his son Noel, continued prospecting and discovered the “Golden Green” mine. Subsequent exploration 1.2km SW by Rimfire involving rock chip, soil sampling and auger drilling defined a curvilinear gold anomaly at > 20ppb Au over a 1.7km strike. The peak gold values were then trenched revealing significant near surface, high-grade gold (9m @ 4.9g/t Au) with peak values up to 87g/t Au at Trench 31. Drilling of the auger geochemistry rapidly defined shallow high-grade oxide Au/Ag mineralisation at and near surface within six structurally controlled oxide to transition zone pods defined along the gold anomaly. The pods are subsequently separated into various targets with the southern portion of the Sorpresa system termed Trench 31, moving north into the Boundary Gate area, Boundary Gate East, Join Up, Roadside Au+/-Ag “Plunging Shoot” and Roadside North which is silver dominant. Detailed geophysics utilizing aeromagnetics, ground gravity and induced polarization techniques were then deployed to enhance targeting and understanding of the gold pods, and with later targeted diamond drilling, high-grade primary mineralisation was intersected (Significant Results). Further RC Drilling successfully targeted down dip extensions to 500m down dip, (200m vertical below surface at Roadside) and 3D modelling facilitated a maiden JORC 2012 mineral resource estimate. Significant intersections to date from the Sorpresa system illustrate the potential for high-grade, and broad intersections in the oxide zone, including narrower high-grade to bonanza grade gold in the oxide and primary. A JORC 2012 Compliant Maiden Mineral Resource Estimate for the Sorpresa system was completed in December 2014, representing a significant milestone for Company. The mineralized system at Sorpresa is a complex overlap of gold and silver mineralization, particularly in the northern Roadside area, therefore reporting provides an account of the individual metals, and the combined metals, within the constraints of the JORC 2012 code. Approximately 70% of gold ounces and 62% of the silver ounces are within 100m from surface which includes Oxide material (Table 2), potentially amenable to heap leach extraction, with an initial metallurgy study (Dec 2013) suggesting up to 93% Au and 74% Ag recoveries. Not only does the resource contain approximately 6.4Mt for 7.9 million ounces of silver and 125,000 Oz of gold (at a 0.5g/t Au & 25g/t Ag cutoff), but at higher cut off grades there is potential for shallow resources at surface, typified by the fact that 70% of the gold ounces and 62% of the silver ounces are within 100m of surface. This includes 1.2Mt @ 1.22g/t Au (0.5g/t Au cutoff) for 47kOz Au of Oxide material. Approximately 70% of the gold ounces and 75% of the silver ounces in the resource is in the Indicated Mineral Resource category, with a target to cost effectively convert a significant proportion of the near surface mineralisation to the Measured category in 2015~16. Preliminary Oxide metallurgy was completed late 2013 on three composite Oxide Zone samples across three locations comprising 130m of mineralization in 30 drill holes. With a standard 24 hour CIL test at 75 micron, very good recoveries were returned, and there were no problems with clays or carbon / graphite. Additional testing on Met1 - Silver Roadside* via a 48 hour CIL, finer grind, improved recoveries to 89.1% for gold and 72.3% for silver. Further metallurgy was undertaken in 2015, including floatation and gravity recoveries, and also in the primary zone. Outcrop, float trails, RC & auger chip logging indicate a diverse range of lithology’s are present. Thisincludes Andesite to basalt lavas, sills/dykes & volcaniclastic siltstone-sandstone-conglomerate, including pyroxene porphyry. Linear belts of fine-grained siliceous rocks, consisting of quartzite and pervasive silica altered volcaniclastic horizons are also present. Localised calcic skarn style, implying calcareous volcaniclastic siltstone horizons within the stratigraphic package are also observed. Gold mineralisation is associated with multi-stage quartz-sulphide, carbonate-sulphide & sulphide (pyrite) rich stockwork veining. Gold mineralisation is spatially associated with a major NE-SW striking shear zone in the hinge zone of major isoclinal fold based on a basement auger geology map & magnetic interpretation. Significant gold rock chip results include 3.4g/t Au, 2.3g/t Au, 2.0g/t Au, 1.9g/t Au, and 1.5g/t Au. Auger drilling has been used extensively at Yoes Lookout, covering an area 1.7km x 0.9km. Exploration to date has revealed potential for a zoned Polymetallic Low Sulphidation Epithermal System, within a hydrothermally altered, quartz – feldspar porphyry sub-volcanic intrusive centre at the Eclipse Trend. Gold and base-metal anomalism is now identified over >4.5km x 0.6km and is open and only partially drill tested. Extensive low sulphidation epithermal quartz-chalcedony-carbonate-barite-sulphide vein & gossanous breccia float with malachite has been observed along with classic epithermal boiling textures. Bonanza gold up to 18.7g/t Au has been defined in rock chips associated with the gossanous epithermal veins with other highlight results including 2.4g/t Au, 40g/t Ag and 0.62% Cu, 0.78% Pb. Potential exists for high grade vein, breccia and semi-massive sulphide replacement styles of gold-silver & base metal mineralisation. The Eclipse area is possibly analogous to the historic high-grade Mount Boppy gold mine (2Mt @ 7.6g/t Au for 800,000oz Au) based on geological & geochemical characteristics. Very limited scope percussion has been conducted at four locations on the trend with the most stunning results returning from Eclipse south prospect of 4m @ 6.5% Cu & 2.3 g/t Au from 119m in Fi0588. Recent exploration advances based on assessment of multi-disciplinary data sets by the company is returning encouraging early stage results at the Transit prospect, which will be tested with percussion drilling shortly. Moonrise Au-As: open Au-As auger anomaly. In the larger Eclipse Trend area geological reconnaissance rock chip and soil sampling continues to define significant early stage extensions and complimentary results to the currently defined Eclipse targets. New targets called Twighlight Dam, CO2 / Shanklin Area, Transit and Moonrise, have returned exceptional first pass rock chip results. The Eclipse Trend is being interpreted as a zoned, polymetallic, low to intermediate sulphidation epithermal (precious and base metal) system, with multiple drill targets emerging over an area >2.7km x 0.6km. The targets are associated with a hydrothermally altered, quartz – feldspar porphyry sub-volcanic intrusive centre identified via mapping and auger logging. Extensive low sulphidation epithermal quartz-chalcedony-carbonate-barite-sulphide vein float and gossanous breccia float is present. A high density of fine grained to medium grained, quartz-feldspar porphyries occur in the central part of Eclipse and are interpreted to represent a sub-volcanic felsic intrusive centre. GOLD 18.7g/t Au, 2.4g/t Au, 2.1g/t Au & 1.8g/t Au. SILVER 32g/t Ag, 21g/t Ag & 13g/t Ag. COPPER 0.62% Cu, 0.60% Cu, 0.60% Cu & 0.59% Cu. LEAD 0.78% Pb, 0.40% Pb & 0.40% Pb. ZINC 0.23% Zn, 021% Zn & 0.21% Zn. Extensive auger holes have been completed at Eclipse to date with drilling ongoing. Ahigh resolution 40m spaced E-W line aeromagnetic survey has also been completed over the prospect. Discrete magnetic anomalies appear semi-coincident with auger geochemical anomalies at the intersection of regional N-S & NW-SE structures. 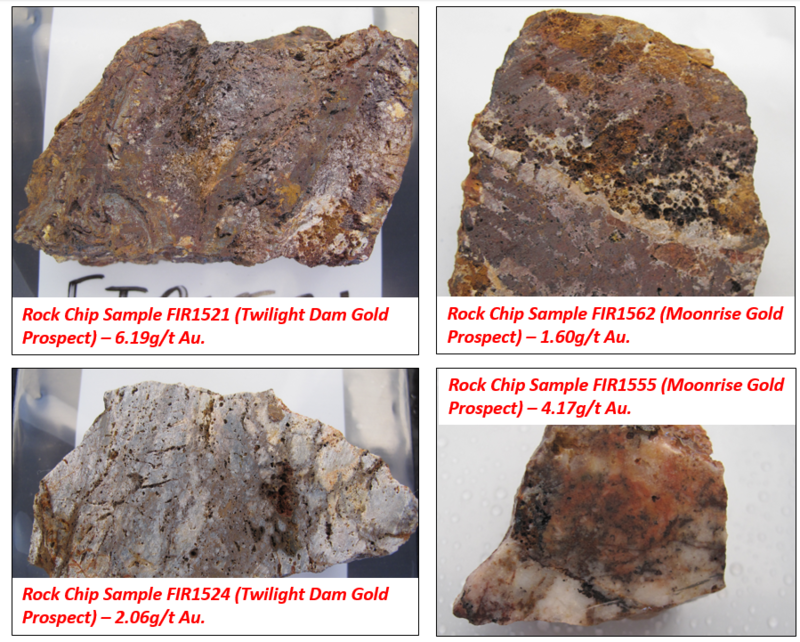 The Roseneath gold prospect occurs within the NE-SW trending Fifield central gold corridor which includes the Eclipse, Yoes and Carlisle gold prospects. Regional soil sampling along fence lines defined a 200m wide zone of anomalous gold (>20ppb Au, up to 362ppb Au) on a single soil line, termed the Roseneath gold prospect. Follow-up geological reconnaissance and rock chip sampling has since defined highly anomalous gold (up to 3.7g/t Au) in brecciated quartz-limonite (after sulphide) vein float & quartz-limonite stockwork veined, pyritic quartzite outcrops. Auger geochemical drilling on a 100m x 20m grid was deployed to define the bedrock source of gold rich quartz vein float samples. Auger drilling has been successful in defining several low-level gold anomalies >15ppb Au (up to 90ppb Au) spatially associated with anomalous gold (up to 3.7g/t Au) in quartz-limonite veined rock chip samples. The gold in auger anomalies are open in multiple directions, with the largest anomaly >300m long x >40m wide & spatially associated with a quartz-feldspar porphyry sill. Importantly, this setting is considered potentially similar to Sorpresa. Structurally controlled, sediment hosted orogenic gold. Epithermal carbonate base metal gold-silver style analogous to Sorpresa based on similar host rock stratigraphy, mineralisation style & auger geochemical anomalism . Additional infill and extensional auger geochemical drilling is planned to progress the emerging targets to drill ready status. Geological reconnaissance and auger chip logging have defined a meta-sedimentary sequence, intruded by sub volcanic quartz-feldspar porphyry sills. The meta-sedimentary sequence consists of interbedded meta-siltstone and meta-sandstone, with localised quartzite and carbonaceous siltstone/ quartzite horizons. Gold mineralisation is spatially associated with brecciated quartz-limonite (after sulphide & carbonate) vein float & quartz-limonite (after sulphide & carbonate) stockwork veined, silica-pyrite altered, quartzite horizons. 7g/t Au, 0.98ppm Ag, 2,930ppm As, 249ppm Cu, 6.4ppm Mo, 107ppm Pb & 8.4ppm Sb (sample FIR1070). 32g/t Au, 0.96ppm Ag, 342ppm As, 526ppm Cu, 82ppm Mo, 61ppm Sb, 4ppm Se & 0.76ppm Te (sample FIR1069). Gold has a moderate to strong correlation with arsenic (0.87), silver (0.73) and lead (0.68). Two samples of gossanous (goethite-jarosite ±hematite) breccia float to the NW of the gold anomalism returned anomalous copper (up to 1,130ppm), arsenic (up to 691ppm), molybdenum (up to 5ppm) & zinc (up to 632ppm). A total of 197 auger holes for 566.8m have been completed to date and average hole depth is 2.9m. Multiple low level, gold in auger geochemical anomalies (>15ppb Au, up to 90ppb Au) have been partially defined & are open in multiple directions. Further auger drilling is being planned to progress the targets to RC drill ready status. The Golden Green Group of prospects are a cluster of primarily historical workings locate approximately 2-3 km west of Sorpresa. The targets represent shallow oxide, high-grade gold satellite occurrences to any future mining proposition of Sorpresa. Rock chip sampling and mapping at Golden Green has returned high-grade rock chip results including 8.21g/t Au and 4.1g/t Au. Samples contain various styles of quartz veining, polymictic breccia’s with quartz vein clasts, sheared and silica-sericite altered siltstone-sandstone wall rocks with box-work textures after sulphides. Collectively, the Golden Green Group are considered prospective for shallow high-grade oxide satellite deposit(s) located within 3km of any potential mining operation at Sorpresa. 4m @ 1.02g/t Au from 12m (Fi0436) *Screen fire assay of this interval returned 1m @ 4.16g/t Au from 13m. Gold and arsenic anomalism in soil sampling over Carlilse Target 1 clearly show strike extensions to the currently drilled mineralization, which will be followed up with further RC drilling.